Explos­ives expert­s have been summon­ed to invest­igate, DIG Malaka­nd Divisi­on. A blast tore through a weekly religious gathering in a suburban village of Swat, killing at least 22 people and wounding over 80. The explosion took place at a centre of the Tableeghi Jamaat, an organisation solely engaged in spreading the Muslim faith, in Takhta Band village around nightfall on Thursday. 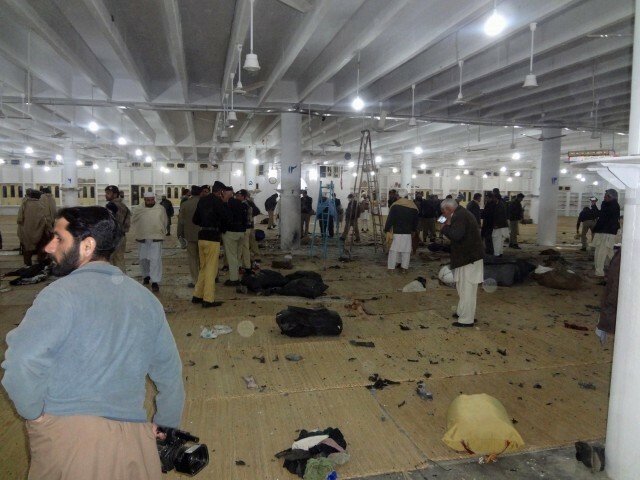 At the time of the blast, witnesses say, up to 1,500 people were present in the main hall of the Tableeghi Markaz. Some even thought that it was a suicide attack – but police were not so sure. “According to initial reports, it was a gas cylinder blast,” said District Police Officer (DPO) Gul Afzal Afridi. The regional police chief, however, refused to rule out any terrorism link. “It could be an act of terrorism,” said Akhtar Hayat, DIG Malakand Division. Explosives experts have been summoned to investigate though there was no sign of any explosives at the blast site, he added. “The death toll has gone up to 22,” Deputy Commissioner Kamran Rehman told reporters at the site. He said 87 people were wounded, out of which 20 are in serious condition. Medics at the Saidu Group of Hospitals said they received up to 50 injured people. “Twelve of them, with critical wounds, expired during the course of treatment,” medical practitioner Rahman Ali told The Express Tribune. Officials warned that the death toll could rise as some of the injured had critical wounds. Medics also referred some victims to hospitals in Peshawar due to their precarious condition. Witnesses said that people were readying for a sermon at the weekly Ijtemah (gathering) when a huge explosion shook the ground floor of the centre. “We saw a flame leaping up followed by a huge explosion,” Shakirullah, who was also wounded in the blast, told The Express Tribune. The blast triggered panic among those inside the Markaz. “The hall was full of smoke and people scurried to get out. Some people rushed to help the injured,” said another witness. At least 93 dead, over 200 wounded in a series of bomb blasts, suicide attack. Incident took place in Karachi’s Gulistan-e-Jauhar locality. SHO, three suspected militants gunned down in crossfire. 19 Shia pilgrims killed in a car bomb attack in Mastung; Jaish al Islami claims responsibility. How does a gas cylinder blast kill 22 people??? @Imran Khan: Time for you to change the mentality of religious bigot mindset to a moderate one to accept different kind of faiths – or it will bring more pain to your country….